Many thanks to May Sebel for sharing this story about her grandfather. My grandfather, Hyman Pearlstone, was a Texan through and through. Born in Buffalo, Texas. in 1878, he was a successful businessman; he owned a wholesale grocery company and served on numerous corporate boards. He loved business, but he loved baseball even more. He was one of the early subscribers to The Sporting News. 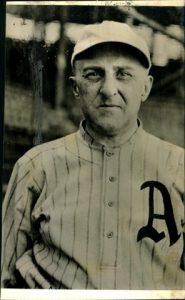 Hyman coached a local baseball team, the Palestine (Texas) Elks, but at that time had no idea what lay ahead of him in the professional baseball world. 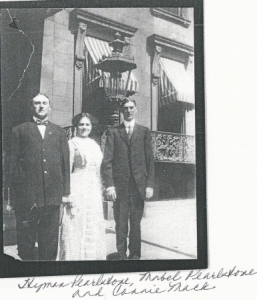 In 1905, he traveled to New Orleans on business and was staying at the Roosevelt Hotel. 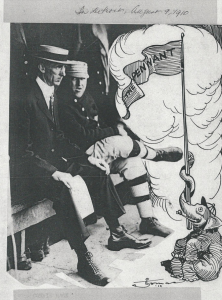 The Philadelphia Athletics were also staying at the hotel and one of the players noticed that Hyman was wearing an Elks pin. He offered to introduce him to another player, also an Elk, who turned out to be Doc Powers, catcher for the team. My grandfather invited Doc to attend the theater with him that evening. Upon learning of my grandfather’s obsession with baseball, Doc Powers told him that the A’s next spring training would be in Marlin, Texas, just down the road from Palestine, and invited my grandfather to come watch the team. At the hotel in Marlin, my grandfather, a true “baseball nut,” introduced himself to Connie Mack. A deep, personal and longtime friendship began at that meeting. Following spring training, Hyman received a large box from Connie Mack. The contents were a baseball uniform, shoes, a hat and a glove. Better than the uniform was a note from Mr. Mack inviting Hyman to spend his summer vacations traveling with the team. Another story related by my father was from the time he was invited to make the summer baseball trip with my grandfather. One night they were having dinner at the Chase Hotel in St. Louis. Ty Cobb was sitting at their table. Hyman suggested they go out on the veranda after dinner for a little chat. “OK,” said Cobb, “if we won’t talk baseball. I want to talk business.” Hyman was business adviser to many of the ballplayers he came to know and later to their widows. My grandmother and grandfather were guests of the Macks at every World Series, and this tradition continued even after Mack sold the team. This is an interesting story from the papers about a special baseball game in Dallas in 1950. These Major League all-star “old-timers” would be appearing at the game.